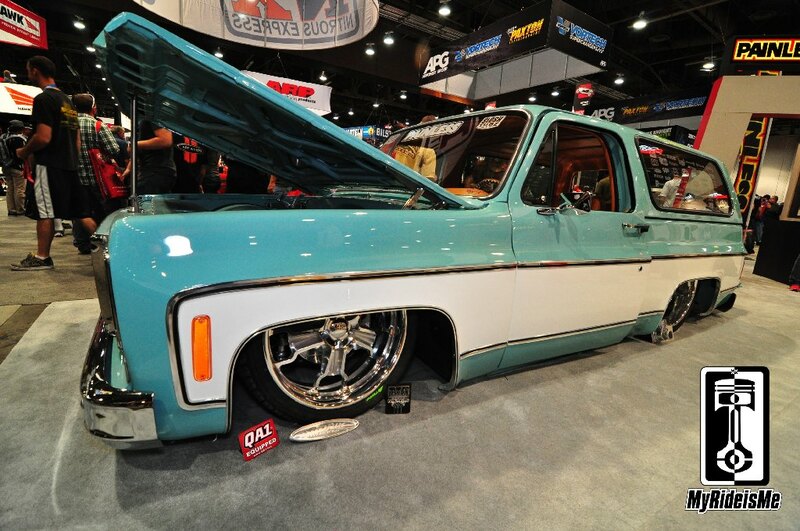 This is the 7th installment of Best of SEMA Show 2013… One more custom truck that might be the cleanest Jimmy you’ve ever seen! Laid out in the Painless Performance booth, feast your eyes on Mike and Sarah Losh’s “Square Peg” Jimmy. To really appreciate this truck, look back on where it came from. 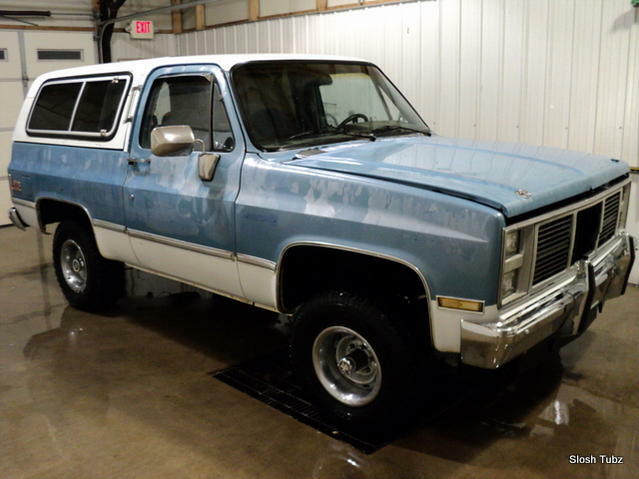 How about starting with a 1987 GMC JIMMY 4×4, then with tons of patience and help from a few SEMA sponsors converting that into a 2WD, frame laying out on the ground LS powered custom hauler! A solid old truck to start with, but the transformation is IMPRESSIVE!! As beautiful as this truck is from the outside, the inside was a plush work of art… nothing less for Mike’s beautiful bride, right? 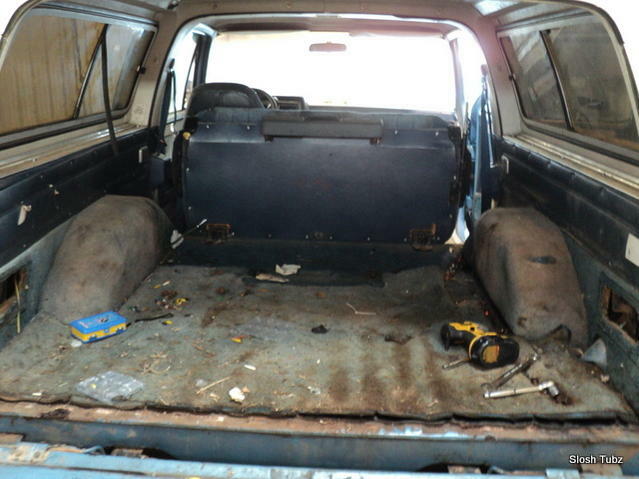 I especially like how the plaid interior fabric’s a throwback to the original interior found in the 4×4. Those kinds of subtle-cool touches set this truck apart. That’s a Painless Performance compact fuse panel hiding in the glove box. Square Peg. Yes, in a round hole. Square’s a reference to the square body style and round hole (Mike, you might need to refresh my memory here…) is just cause they’re doing things a little differently. Look closely in the picture below and you’ll see, in fact, a square piece of wood mounted in a round one. The gorgeous wood is from BedWood. I’m thinking of doing something similar in my 63 Falcon Wagon project. Guess it’s not an original idea anymore! Not shown, but trust me… Mike put in an LS motor. While becoming the (somewhat boring looking) standard in hot rods these days, you can’t deny the power-per-dollar of the LS. 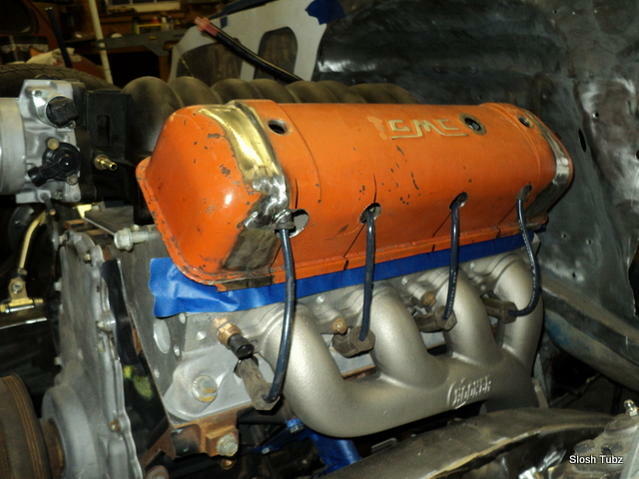 But that’s not my point… check out the custom valve covers Mike made to spruce up his LS. PERFECT! No more coil packs showing you’re true motor-vation as modern LS, and even more important, all those unsightly wires are gone. Only one problem Mike told me… finding a matching valve cover for the other side! You can just see the valve covers poking out in the picture below. 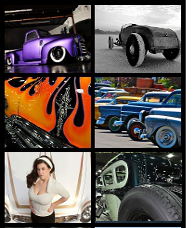 You can also see Mike’s own custom truck product, “Slosh Tubz”. Mike’s not a fan of mashing trucks like his down, then leaving the inner fender wells off. So, he made some and is selling them. There are a few pictures of installed Slosh Tubz here. Not sure if this truck could get any cleaner, but the detail under the hood helps. Thanks to Mike for the info and the couple pictures of the in-progress build, and thanks to Dennis at Painless for the intro. Sarah, enjoy your new truck! Are custom truck your thing? 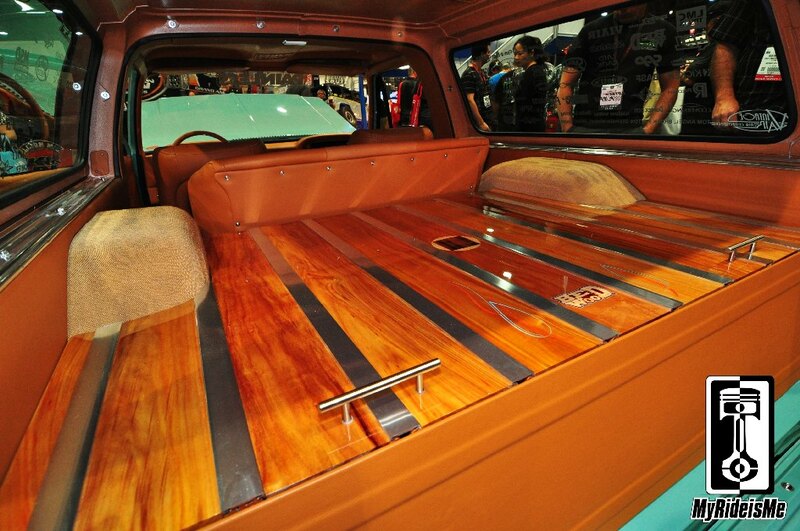 Dig this 1964 C10 converted to a dually laying semi 22’s. Awesome, thanks for the great write up and pictures ! 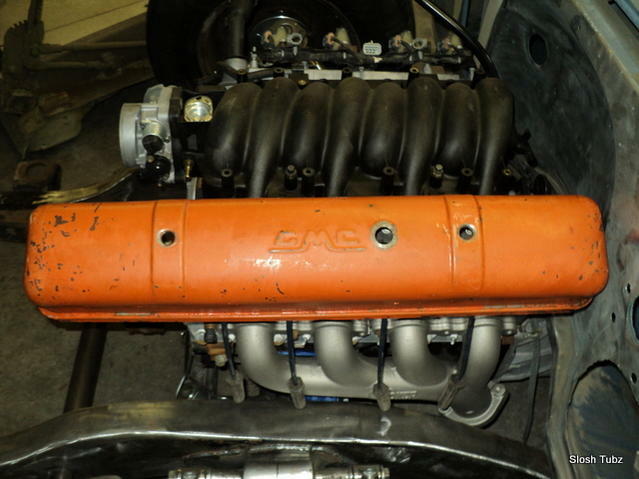 is there a more in depth write up on how those valve covers were mad to fit over the coils?